PWM Charge Controller, 30A, 12/24VDC, #6 AWG, 3-Position Battery Select, LED Indicators. 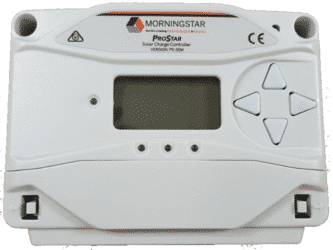 Morningstar’s ProStar PS-30M is the world’s leading mid-range solar charge controller for both professional and consumer applications. This second generation ProStar adds new features and protections using highly advanced technology, provides longer battery life and improved system performance; and sets new standards for reliability and self-diagnostics. 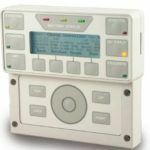 Morningstar’s ProStar series solar charge controllers work great with: leisure (caravan and boating), residential, rural electrification and solar energy systems, security and instrumentation, off-grid solar applications, telecommunications, transportation and traffic. ProStar modles come equipped with a five year warranty, and have received CE certification. The Best in it’s Class – Estimated 15 year life span. PWM series batty charging (not shunt). 3-position battery select: gel, sealed or flooded. Highly accurate control and measurement. Jumper to eliminate telecom noise. Parallel connection supports up to 300 Amps. Smart temperature compensation. Tropicalization: conformal coating, stainless-steel fasteners & anodized aluminum heat sink. 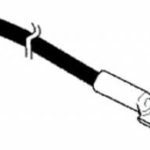 No switching or measurement in the grounding leg. Highly Efficient – 100% solid state. Very low voltage drops. Current compensated low voltage disconnect (LVD). LED’s indicate battery status and faults. Capable of 25% overloads. Remote battery voltage sense terminals. 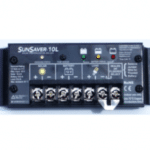 Electronic Protection & Safety – Short-circuit (solar and load). Overload (solar and load). Reverse polarity. Reverse current at night. High voltage disconnect. High temperature disconnect. Lightning and transient surge protection. Loads protected from voltage spikes. Automatic recovery with all protections.